1986! Hands Across America! Licensed to Ill! The Oprah Winfrey Show! A big year, with some big punches! Here are a few of the breakout properties for Holiday 1986. It’s worth pointing out that most of these properties had accompanying TV shows, a good indicator of how well-oiled the toy licensing machine was by this point. MASK was my personal jam in the ’80s. Vehicles that could turn into other vehicles? Sign me up. Seriously. This was one of those franchises where the toys more or less met the promise of the show. Each vehicle came with a figure, which wasn’t a given back then. These commercials reflect the high level of effort put into this franchise. By 1986 there was live action WWF wrestling, there was animated WWF wrestling, and there was video game WWF wrestling. It’s safe to say that the World Wrestling Federation knew what a gold mine they had on their hands, and you can see the proof in the variety of toys that were available for the holiday. Worlds of Wonder’s (the Teddy Ruxpin folks) new toy for 1986, Lazer Tag, illustrates that optimism for future technology that’s so bespoke of the ’80s. The tech didn’t really work, at least not well, but that didn’t stop us as a society from pouring our consumer dollars into the idea, the promise. Lazer Tag was what it sounds like: you strapped sensors onto your chest and ran around shooting each other with laser guns. The reception wasn’t great, the guns weren’t accurate, and the games weren’t organized, but with a little imagination it was a lot of fun. And the ads were great. Another personal jam from the’80s, these tiny, grotesque wrestlers came in hundreds of different varieties. 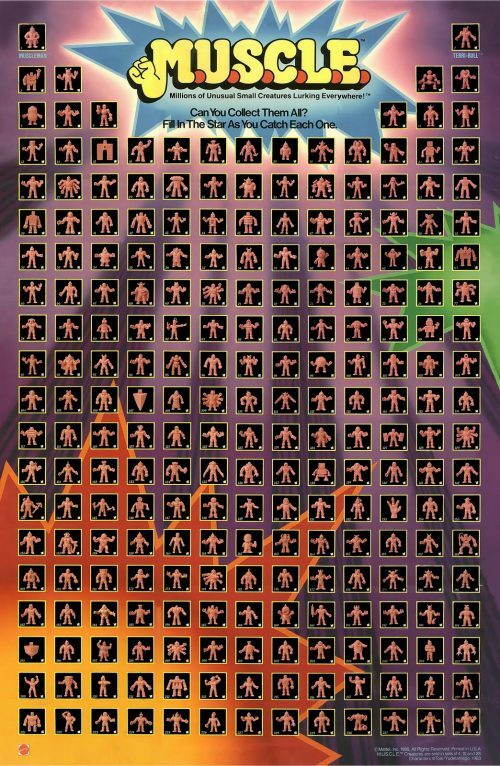 The range of M.U.S.C.L.E. wrestler designs was impressive and really made for some imaginative play. These ads strangely position them as an horde of ugly invaders and suggest our only hope of getting rid of them is to make them wrestle themselves away, which seems an odd positioning. The must-have toys of ’86 were these guys, these plush rescue dogs that came in little ‘pound’ doghouses. There were big ones and little ones, all colors and breeds. Looking back on it now you’d think there’d have been a more direct connective message of “hey, if you get a real dog, consider rescuing one from the pound, too,” but I guess we weren’t really there with that sort of idea yet. Still, these guys were insultingly cute and their companion show was no different. So much weirdness about this last commercial, though. The kid giving a Pound Puppy to Grandma? The little girl popping out of an oversized birthday cake with a Pound Puppy? The curmudgeony business-man with his secret Pound Puppy under the desk? This spot reeks of the hubris of a successful product that leads a Marketing department to assume they can ‘have a little weird fun’ with their product. I’m not there.